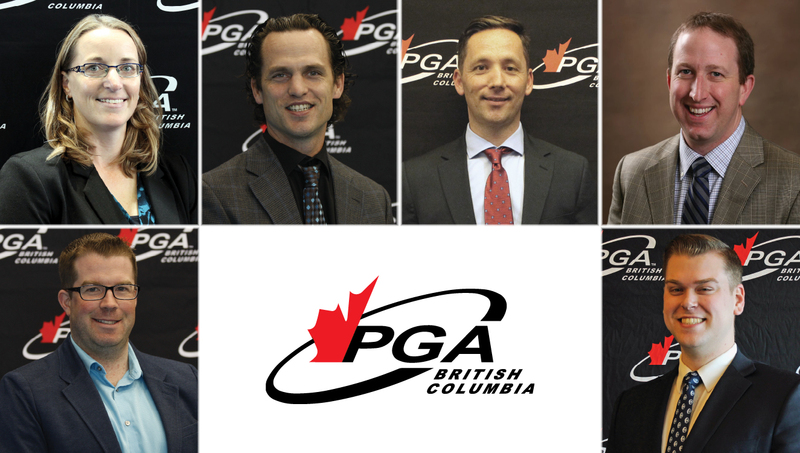 Clockwise from top left, Cindy Soukoroff, Brian Wise, Lenny Cyr, Mark Thirtle, Jared Siminoff and Steve Liddicoat have all be elected to the PGA of BC Board of Directors by their colleagues through a membership-wide vote. RICHMOND, BC (PGA of British Columbia) – The PGA of BC is pleased to release the results of the Association’s 2019 Board of Directors election. Bill Kelly (Glacier Greens Golf Club, seven-year tenure on Board), Russ Latimer (Black Mountain Golf Club, four years), Greg Pool (Capilano Golf & Country Club, four years), Norman Baufeld (GolfTEC Vancouver, two years) and Jamie Stevens (Kelowna Golf & Country Club, two years) will serve out the remainder of their terms on the Board of Directors until the AGM. On behalf of the PGA of BC, we thank them for their years of service and dedication to the Association.